If you have ever wondered what those bumps under eyes were, what caused them and how to get rid of them, this guide may give you some insight. 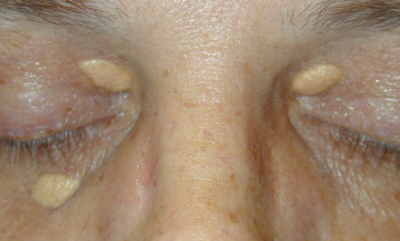 The three most common conditions associated with small bumps under eyes are described below. Milia appear as 1-2 mm dome-shaped bumps that are white-to-yellow in color. They do not cause itchiness or pain. Commonly, it is found beneath the eyes of people of all ages. They are caused when keratin (a substance produced by the skin) becomes entrapped below the outer layer of the skin, forming a tiny cyst that you probably describe as little bumps under eyes. They are formed at the base of a sweat gland or hair follicle. Anytime you notice new bumps on your skin, it is a good idea to seek the advice of your physician or dermatologist. If you found milia in infants, there is no need for treatment since milia is common in infants and generally disappears within a few weeks. Piercing each milium with a scalpel or sterile lancet, followed by the removal of the cyst with a specialized tool. The application of topical retinoid creams such as adapalenc, tretinoin or tazarotene. A series of microdermabrasion procedures or acid peels at the dermatologist’s office. Syringoma is a non-cancerous bump which is usually noticed on the upper cheeks and lower eyelids of young adults. 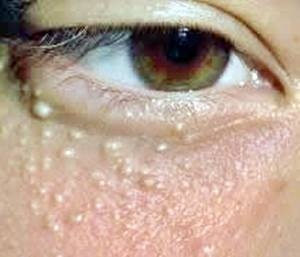 They are caused by the overgrowth of eccrine glands (cells from sweat glands) and they do not itch or cause any pain.These bumps under eyes can appear at any age, though they usually occur after puberty. Step 1: The skin is numbed with an injectable anesthetic. Step 2: Using a flexible razor blade, a scalpel or a tiny cookie cutter (punch biopsy), your physician will obtain a small sample of the skin. If a punch biopsy is taken, it may be necessary to have a suture or two placed. Step 3: The skin sample will be examined under the microscope by a specialized physician known as a dermatopathologist. As syringoma is a benign condition, even if this diagnosis is confirmed by the biopsy, no treatment is necessary. However, some find them cosmetically disturbing and request removal of small bumps under eyes. Xanthelasma is a skin condition that causes the development of flat yellow growths on the upper or lower eyelids. The lesions contain deposits that are high in fat and are often seen in those with high cholesterol or other fats in the blood. These bumps under eyes are yellow-to-orange in color and may range in size from 2-30 mm with a flat surface. Once these lesions are present, they do not generally disappear; in fact, they frequently grow larger in size and quantity. Xanthelasma is not typically itchy or tender and most seek treatment for cosmetic reasons only. To confirm the diagnosis and rule out cancer, your physician will likely perform a skin biopsy in the manner described above. Should a diagnosis of xanthelasma be confirmed, your physician will likely check your cholesterol levels. If abnormal, it’s likely he/she may recommend a healthy diet, exercise and even necessary medication. There is a risk for scarring with all of these treatments for bumps under eyes, and there is no guarantee that new lesions will not form. Also, this guide is not intended to help confirm a diagnosis, any new bumps or lesions noted under your eyes should be properly evaluated by a healthcare provider.